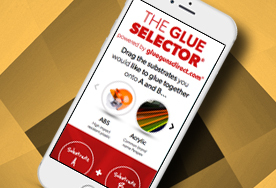 Not sure to which Glue Sticks to use from our extensive range ? We are more than just a glue stick, Tecbond hot melt adhesives are used in a vast range of applications, markets and for bonding difficult substrates. What can we glue for you? We are challenged on a daily basis to find the answer to various adhesive problems and new applications. Tecbond Hot melt adhesives have moved leaps and bounds in recent times with many new grades and technologies becoming available, allowing formulations to be based on Polyamide, Polyurethane, Acrylic, Polyolefin, and EVA to give the user a greater choice of instant bonding adhesive technologies. 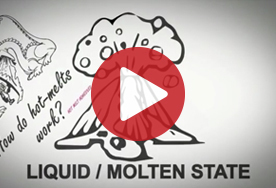 Hot Melt Adhesives do have limitations! Being a thermoplastic product hot melt adhesives soften with heat and return to a solid state by the loss of heat. With this in mind, standard hot melt adhesives are not recommend for applications subjected to heat or direct sunlight. However we do offer grades with high heat resistance. Water and hot melt adhesives are a bad combination – standard hot melt adhesives are not waterproof and should be avoided for external applications. On saying this, we do have PUR adhesives that can be use externally and can even be dry cleaned! 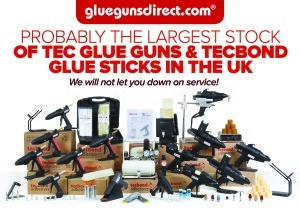 And probably have the largest stock of Tec glue guns and Tecbond adhesives in the UK, if not Europe, we will not let you down on service, price or delivery. Tecbond Hot Melt Adhesives are made in the UK !